It had been a while since I’d eaten a Lofthouse cookie, but they came up in conversation so I picked up a box to refresh my memory. Given the rave reviews, I was excited about re-trying them since I’d completely forgotten how they tasted. I chose the ones with blue frosting and Fuzz approved. First, I made a batch of the old Recipe Goldmine Lofthouse clone which I’d made in the past. Those cookies were delicious, but they were too puffy, cakey and yellow. Still, they were really good — especially after sitting frosted in a closed container overnight. They were more like mini iced yellow cakes. Next I tried a few recipes in a thread by some ladies who were doing their own cloning, including one who claimed she had the original ingredient list. I tried her recipe plus a few others in the thread (none of the ones including cake mix, though) and didn’t feel the cookies were very tasty. They were definitely denser than the previous, cakey & yellow clone, but just not as flavorful. Finally, I tried going off on my own. I tried a few recipes with heavy cream, a few more with sour cream, and because rice flour was an ingredient on the label of the original cookies, I tried incorporating it into a few recipes. None of my cookies were as good as Lofthouse or even the original cakey recipe (first one I mentioned). In the end, and I’m sorry to have such boring results, the old original clone version — the one on Recipe Goldmine was the best tasting of the bunch. Of course that’s partially due to the icing. I tried lots of variations. Italian Meringue wasn’t sweet enough and neither was a marshmallow butter cream. The basic butter cream recipe on the side of the powdered sugar box was delicious, but I hate to say that the most delicious, best textured frosting was one from a scrapbookers thread that was made with egg whites, shortening, butter, powdered sugar and flavorings. I liked the flavor and loved how it crusted over like the original Lofthouse frosting. What I didn’t like was that it had raw egg and shortening. The raw egg problem had an easy fix – pasteurized egg whites did the trick. As for the shortening, I tried substituting butter. That worked just fine, but the version with half shortening and half butter had a more ethereal texture. In the end, here’s the final recipe. It’s not quite a Lofthouse clone, but it makes really tasty sugar cookies that taste better on day 2. By the way, Fuzz decorated the cookie. She insisted on squeezing some of that yellow decorating icing, the kind that comes in a tube, on top. 4 ½ cups of powdered sugar. In a large mixing bowl, beat butter until creamy. Add sugar and continue beating until creamy and light. Add eggs one by one, beating until incorporated. Beat in vanilla, baking soda and baking powder. Put half the dough in the refrigerator until ready to use. Roll the remaining dough about 1/4 inch thick and cut into small circles. Arrange on a parchment lined cookie sheet and bake for 12-15 minutes or until cookies are lightly brown around the edges. Bake one sheet at a time until dough is gone. For best results, weigh your flour. 1 cup should be about 4.5 ounces on a scale, so if you use 5 cups you'll use about 22.5 ounces of flour. I used 6 cups, which was 27 ounces. If you don't have a scale, make sure to stir and fluff up your flour before using. If you pack it into the cup, you'll use too much and the cookies might be a little dry. Have you tried the cookie recipe on the Jiffy Baking Mix box? I found a recipe on all recipes that uses it and they look very similar. She even did a blog with comparisons to different baking mixes. The user is mis7up. Interesting! The type I bought didn’t have cream cheese, so I guess some varieties have different ingredients. hmmm, I guess I could have scrolled down to the end of your recipe and realize the frosting recipe it posted right there- sorry!! Anna, do you have a link to the frosting recipe that you mentioned with the egg white, shortening, butter, powdered sugar etc? I want to try some of these recipes this week and need a really good frosting recipe to go with them. Thanks. 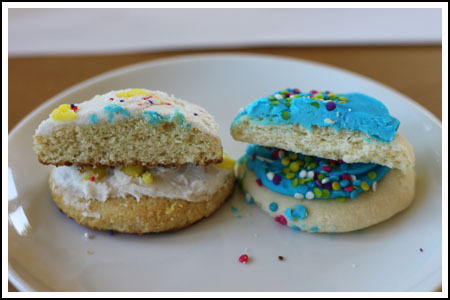 I have never tried a Lofthouse cookie until yesterday. Right as I walked into Walmart they had a huge display of brightly covered cookies and I thought “those must be those cookies Anna blogged about.” I bought some green ones and *oh my holy heavens*. They were delicious. So light. So buttery and delicious. Not at all what I thought they would taste like. Louise and Sue, maybe you tasted cornstarch? John mentioned tasting a starchy flavor. Metallic or bitter flavor would probably be baking powder or cream of tartar. I gave away the rest of my cookies, but if I had a package here I’d look again. I just looked up cream of tartar and it’s also called, “potassium hydrogen tartrate”. I wonder if it’s in there? I wondered if that taste came from cream of tartar? It doesn’t list cream of tartar on the ingredients on the package I bought, but of course that doesn’t mean it isn’t in there. I haven’t had these before, but I’m all about sugar cookies so I know they’d be right up my alley and I’ll have to try them! Thanks Erin! I’ll add this one to the list I’m making. Frost with homemade butter cream tinted pink or canned frosting tinted pink… add sprinkles! John, thank! I’m going to try that one next week. I have a couple of others to test as well. Even if none of them are identical to Lofthouse, it will be good to have some new and good sugar cookie recipes. About the cake flour, at first I was trying to go in accordance with the Lofthouse ingredient list which from memory, is something like this — flour, butter, confectioners sugar, sugar, eggs, rice flour, water, non-dairy milk powder….not necessarily in that exact order, but something close to (I threw away the label). Our grocery store, H.E.B. has a house brand and their ingredient list is similar except that they designate the flour as “bleached” and rather than rice flour, they use “modified food starch”. So I think they do incorporate some sort of start be it rice flour or cornstarch. Cornstarch is less expensive. Neither ingredient list mentioned cake flour, but I should try that too. At this point I need to “step away” from their ingredient list and focus on what home ingredients I have will come close to the real thing. This Amish recipe sounds like it would be close, but I will have to try it first to be sure. Combine sugars, butter, and oil; beat well. Add eggs, beating well. Add cornstarch, baking soda, and cream of tartar to flour. 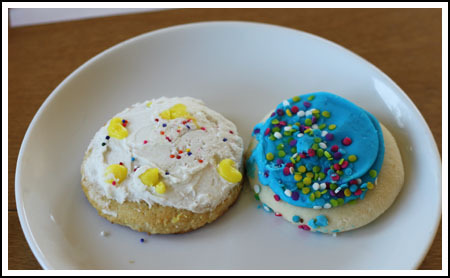 Mix all ingredients and drop by tablespoonfuls onto an ungreased cookie sheet. Bake @ 375 degrees for 10 minutes or until lightly browned. Have you tried making them with cake flour or 1/2 cake flour and 1/2 AP flour? I also seem to taste corn starch in the cookies when I eat them. Just a thought. I love those cookies, and hate them at the same time. I swear I’ll only eat one, but they’re like cookie crack. I keep saying just one more, and then before you know it the package is gone. I think that the reason no one can successfully clone them is that they’re made by aliens. How else could they be so good? These are the only cookies my son will eat…we always have a fresh supply in our house! We can find them most anywhere here in central Kentucky. We usually get them at Walmart in the bakery section. Sue…they have them at all Target’s in MN…they are incredibly addicting! I remember seeing them most of individually wrapped at convenience stores. They were the size of your head and always had pink frosting. i’ve never had a lofthouse cookie either, but these look fun and i love the description of them and all your testing 🙂 great job!!! I also have never heard of these cookies so I can’t say I know what they taste like. However, Someone previously mentioned Cheryl & Co cookies and I have made them. They’re fun to decorate, too! Lots of egg yolks! And the almond extract is a little different. I always halve the batch because the full amount doesn’t all fit into my mixer bowl! Just curious if you tried this recipe? It’s been on my to-do list for awhile. I actually wrote an “Ode to Pink Icing” when I was younger in honor of these cookies. They are SO good! I can imagine that the texture of the cookie is pretty hard to duplicate… might have to pick up a box before too long! I’ve never heard of or eaten a Lofthouse cookie. I’m guessing we don’t get them in Canada. Not in Toronto anyway. They look yummy though, I love anything with frosting!! These look so pretty. Probably not something that I’d be tempted by, but when I tried Publix Calypso cookies, I was amazed at how good they were. I always get a laugh out of what constitutes a serving size on packaged goods, especially sweets. More often than not they deliberately make a serving size unreasonably small to make the sugars and fats look less daunting! Jessica, that is crazy! Lofthouse has a hold on VA. Ha. Sigh….sorry Anna that you made so many cookies trying to copy something that seems so much easier to just grab at the store! How I would love to have the exact recipe of these cookies, but if it is so hard to copy – I think I’ll just forgo and grab a box. 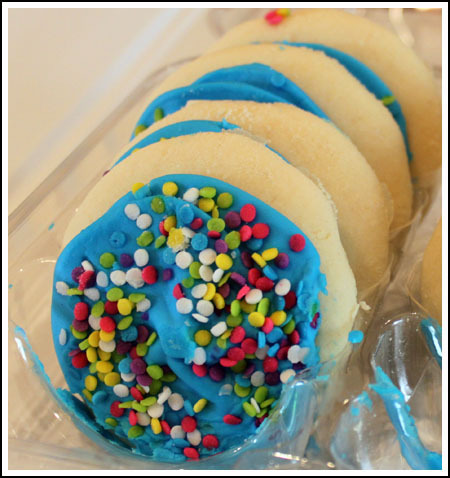 I actually can only eat 1, because while they are yummy, I’m just not a fan of sugar cookies. My kids and hubby love them though, so I pick up a box for special occassions. There are just some things (Mother’s Iced Animal Cookies, Chips A hoy, Oreo’s) that do taste better store bought! Hard to admit for someone like me who likes to learn to do everything from scratch and use clone recipes that taste better at home! you can get them almost anywhere here in va. up to and including gas stations! Corinne, that is so funny! Sue, they have them at Wal&Mart & Sam’s Club. I’m sure you can find them somewhere in MN. I think they originated out west, though…I should just check their page. Sarah, I agree. Every so often I’ll buy grocery store bakery cookies just to see if I’m missing out on anything. It seems I’m not. Well, except for the Publix Calypso Cookies. Francesca, I think you should just buy the cookies. The clone recipe on-line is very good, but it’s different than the real cookies. You made them!! I was SO tempted to buy a container at the store the other night – I didn’t, though, because one cookie has 180 calories! Yikes! In the past, I used to eat two per night. I even used to keep some in my car, so that I could eat them after my commute to school. Needless to say, I LOVE these cookies! I might have to try your version in the future! Thanks so much! Yummy! A friend and I got a container of mini-Lofthouses once, and thought we could somehow eat less that way… definitely ate the entire thing of them that afternoon. So so delicious. And we are so so fat.